One of the cool and unique things about our newest feature, Proposals, is that when you upload a sales deck it will automatically be matched with and receive specific sponsor recommendations based on all of the data within SponsorPitch. 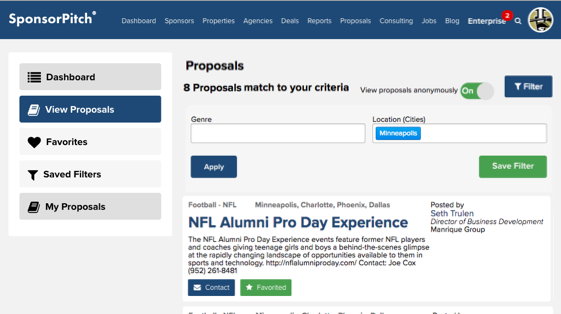 These sponsor recommendations are unique to each proposal and can be found in the fourth column of your proposal page as shown below. We've already got a number of diverse and unique opps for sponsors to discover so be sure to add your proposal today! Thank you for all your support as building on the SponsorPitch platform would not be possible without the support of our loyal subscribers! We're already hard at work building several new features and integrations for Proposals, which we will come in the 4th quarter, and are intended to increase the value we deliver to you through this new addition to the platform.